Super Charged Blog: Antwan Barnes most underrated player on chargers roster? Antwan Barnes has had a terrific pair of season for the chargers so far and he doesn't seem to be recognised by many as a top player. This could be due to him having only one 10+ sack season (last year) but he appears to be a hidden gem for the chargers. Barnes entered the league in 2007 after being drafted by the Ravens in the 4th round. He was a promising rookie notching up a few sacks and was an excellent special teamer. He for some reason became unpopular with the head coach Harbough and was traded to the Eagles for a meagre 7th rounder. He did little of note in Philadelphia and was released in October 2010. And then the chargers made an under the radar signing which has proven a great success. Barnes stepped straight in for the chargers and nailed Brady twice in his first game for the chargers. He finished the season with 4.5 sacks. It was in 2011 however that Barnes made his main impact. 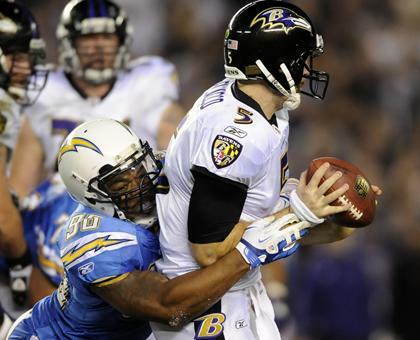 Antwan racked up 11 sacks for the chargers, 4 of these came in the game against his former Ravens. He played very well all season and became chargers top pass rusher by a mile after Phillips' poor season by his standards. He won't be slowing down and taking it easy now though as he has a contract year coming up and I'm sure would like the pay day he deserves. I think paired up with Ingram and Phillips in a pass rush linebacker rotation he can be part of a ruthless pass rushing attack, something the chargers have been dreaming of for a few years now. But with all that he achieved you ask an average fan, lets say an NFC North for example, to name the players the think of when they think chargers I guarantee very few would say Barnes' name. This must surely change and if Barnes puts in another performance like he did last season I expect him to gain the recognition he deserves. So my message to you readers is when you see the number 98 lining up to rush the passer, you can feel confident that the passer won't get much time in the pocket. Also lets get his name out there guys!